In the last week the leaves around here have began to change to all the beautiful colors of autumn. We have been enjoying the leaves and lovely fall weather with lots of afternoon walks, which generally result in a pocketful of leaves, acorns and other fall treasures found along the way. 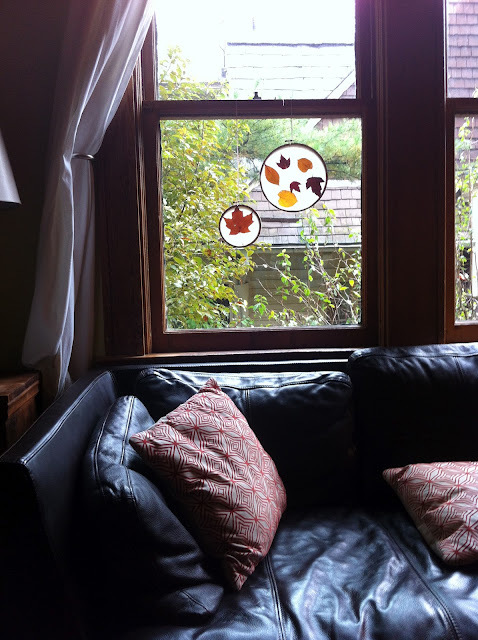 In an attempt to use both our found treasures and some embroidery hoops I had left over from another project I thought we would try to make some little fall leaf stained glass windows. We started by gathering our materials: wax paper, iron, scissors, sharpie marker, several embroidery hoops and bakers twine. I then took out a large piece of wax paper and traced a few of the hoops onto the paper with sharpie marker. Making sure to leave a bit of space between the circles. I then put a pile of leaves we had gathered on the table and let the Bee arrange the leaves in the circles. I explained that she could arrange the leaves however she wanted as long as they were in a single layer and all fit in the circle. For the smaller hoop we found that only one leaf could really fit. While she was arranging I plugged in the iron and turned it to 5 which was the wool setting. I also laid a towel on the table and cut another long piece of wax paper the same size as the first piece. When the Bee was done arranging we carefully moved the wax paper with the leaves onto the towel and covered it with the 2nd piece of wax paper. I then carefully ironed directly onto the wax paper. Making sure to keep the iron moving and allowing the heat to fuse the two pieces of wax paper together. There is a little bit of a smell of the leaves reacting to the heat. After the wax papers were fully fused, I unplugged the iron and let the paper cool for just a second. I then carefully cut out the circle shape I had drawn with the sharpie, being sure to not cut right on the line but 1/2 inch outside of the line. I then lay the cut out circle over the outer part of the embroidery hoop and carefully pushed the inner part down, holding the paper into place. Next I tightened the hook of the embroidery hoop and trimmed off any extra wax paper that was sticking out. I tied a little piece of bakers twine around the latch of the hoop and hung it from the window. 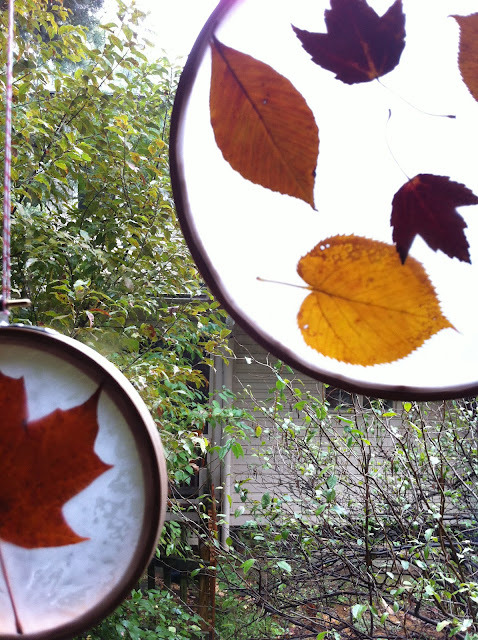 The leaves look so beautiful when the sun comes through the wax paper. They really do look like little stained glass windows. The girls love them, especially that they are leaves that they found and collected.